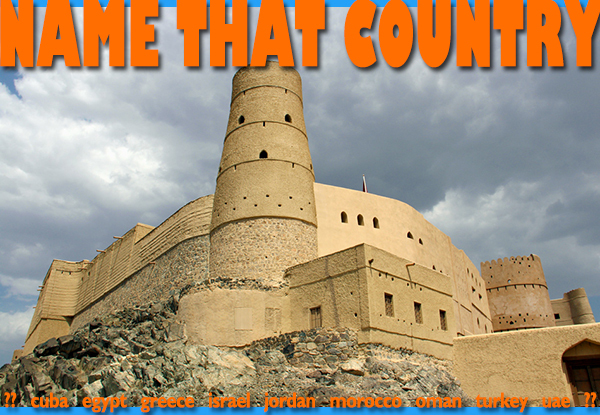 Bahla Fort is just one of many historical forts in our mystery country. It is, however, one of the oldest and the only one listed as a UNESCO Historical Site. The site is an oasis in the foothills of the Jabal al-Akhdar (the Green Mountain, part of the Al Hajar Mountains) in the interior of the country, about a 1/2-hour drive from the city of Nizwa. Bahla was built by The Nabhani dynasty, which ruled the area and controlled the lucrative trade of Frankincense from the 12th to 15th centuries. Construction of the sprawling complex, which is enclosed by a wall over 12km in length, was on-going throughout Nabhani rule and beyond. This entry was posted in name that country quiz, Oman and tagged al hajar mountains, Bahla fort, jabal al-akhdar, nizwa, Oman, Oman tours by yalla2013. Bookmark the permalink.